Thursday evening, I returned home to find a box from New Balance waiting at my door. The contents were a dangerously tempting prototype that I had patiently waited over a year for. I am a 10.5, but samples only come in 9.5's. I swapped out insoles, put on my thinnest socks and tried a 5 mile run at Ray Miller on Friday with Renn. The taste was addicting and I was convinced they were going to be a blast to race in on Saturday..
And for the first 15 miles, they were fast and fun. Though I wasn't quite moving at Chad Ricklefs pace, I was within 2-5 minutes, and well ahead of the 50 milers. But, like Cinderella's midnight curfew, my glass slipper escapade ended on Coyote Ridge as the technical terrain became too much for my swelling feet to handle. 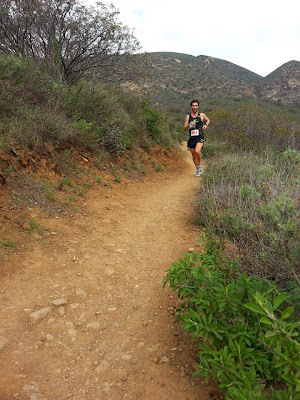 My toenails were hammered with every step downhill and my quads worked overtime to keep my body in control. My mind wandered to Mt. Mitchell 40mi, Old Goats 50mi, and Zane Gray 50mi and I wondered why I had signed up for so many races this spring. I'd only get more pain, suffering, and adversity in those longer races; why do I do this sport?? Alas, one great thing about 50k's is that the suffering is relatively short, so you can escape despair by quickly crossing the finish line. Today the low parts lasted for a good 10 miles until I exited Serrano Valley and saddled up for the climb up Overlook. I saw Van about a minute back on the climb and resolved to run as much as possible on the climb to avoid a showdown (and eminent demise of my toes) on Ray Miller. I ran every step, yet Van still kept holding on. 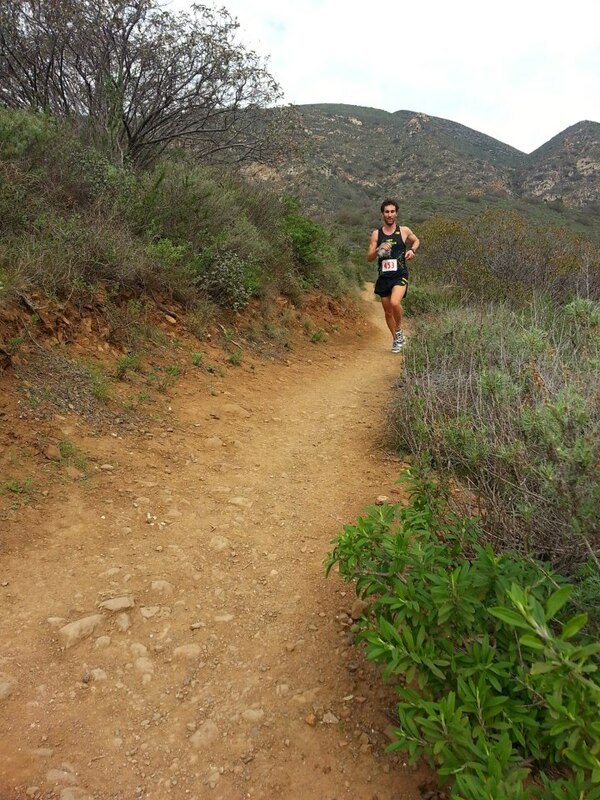 Luckily the buffed out nature of Ray Miller let me fake a downhill stride well enough to hold on to 3rd in 4:21. The day was a good reminder of how dumb I can still be. The race wasn't the most important event of the year, but if I had waited a few extra days to wear the proto, I could've ran a bit faster in shoes that fit me. I'll have another 2 showdowns with Chris this year at Old Goats and Zane Gray, so I'll live, learn, train with Chris some more, and then hopefully beat him. Tapered for the race and let the body get an extra step back week for good measure. I'm focused on my next three races and a big May and June mileage-wise. It was fun running with you the first 19 miles. I've got a feeling Old Goats and Zane Grey are going to be fun, the two of us battling it out and all. Regarding you living, learning and training with me: I'm totally down to keep training with you and us learning from each other, BUT living with me? Really? Sorry, that's Katie's job. Congrats on your 4th place finish. Man, I should of just showed up and run hurt. I would have smoked both of you guys. Great job holding down the fort for SoCal. Shameful. I guess I will be the Great White Socal Hope at Zane Grey. How did you feel about all the work you put into opening your form on the flats?